If you want to have food around 2pm in Freiburg im Breisgau this might actually be quite challenging. After unsuccessfully trying a couple of restaurants which had been recommended, it was finally time to give ‘Tom’s’ a shot. 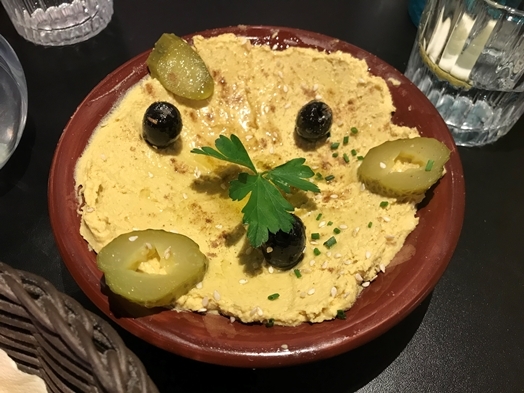 As a starter I went for the “hummus (chickpeas puree, baguette & olives)” (EUR 6.90) which was interesting. It was, first of all, a curry hummus and second of all, super dense. It needed some proper effort to take the humus of the bowl. Didn’t taste bad but I just wouldn’t call it hummus. 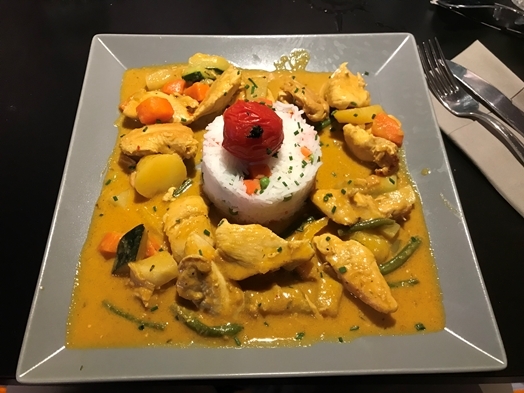 The “chicken curry (yellow chicken curry, vegetables, jasmine rice)” (EUR 10.80) on the other hand was much better than expected. The quality of the meat was better than I had thought it would be and overall, the curry was actually quite in rich in taste and flavour. It definitely helped that the vegetables were adding to the taste. The place is rather simple but functional and the service is friendly and manages to bring the ordered dishes within a rather short time frame. Prices are also decent (not only for the food but also) for the beverages with EUR 5.80 for a bottle of sparkling water and EUR 3.20 for a double espresso. Frankly, Tom’s isn’t my favourite place on earth but for the price you pay you get a decent meal.